** Concentrated solutions are often stored in the laboratory stockroom for use as needed. Frequently we dilute these “stock” solutions before working with them. 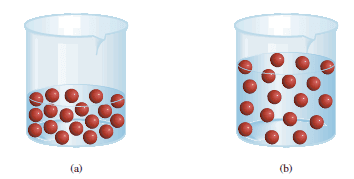 ** Dilution is the procedure for preparing a less concentrated solution from a more concentrated one. Therefore, we must withdraw 400 mL from the 1.00 M KMnO4 solution and dilute it to 1000 mL by adding water (in a 1-L volumetric flask). 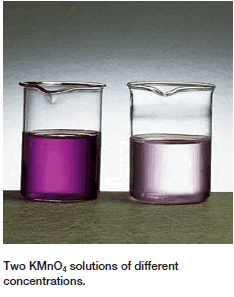 This method gives us 1 L of the desired solution of 0.400 M KMnO4 . ** In carrying out a dilution process, it is useful to remember that adding more solvent to a given amount of the stock solution changes (decreases) the concentration of the solution without changing the number of moles of solute present in the solution. Vi and Vf are the initial and final volumes of the solution, respectively. ** Of course, the units of Vi and Vf must be the same (mL or L) for the calculation to work. ** To check the reasonableness of your results, be sure that Mi > Mf and Vf > Vi. Describe how you would prepare 5.00 × 102 mL of a 1.75 M H2SO4 solution, starting with an 8.61 M stock solution of H2SO4 . Because the concentration of the final solution is less than that of the original one, this is a dilution process. 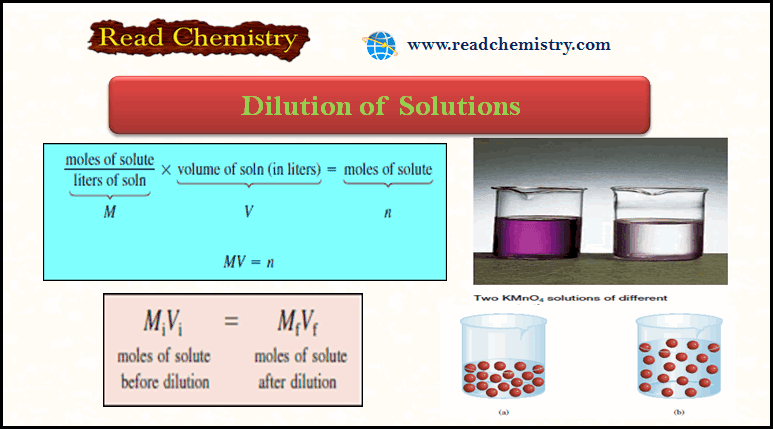 Keep in mind that in dilution, the concentration of the solution decreases but the number of moles of the solute remains the same. Thus, we must dilute 102 mL of the 8.61 M H2SO4 solution with sufficient water to give a final volume of 5.00 × 102 mL in a 500-mL volumetric flask to obtain the desired concentration. The initial volume is less than the fi nal volume, so the answer is reasonable.